The 2018 Portland Rose Festival starts in just a few days. The official opening of the annual event is marked by beautiful fireworks over the river on Friday, May 25. The main events of the Rose Festival, most of them FREE, are listed here. 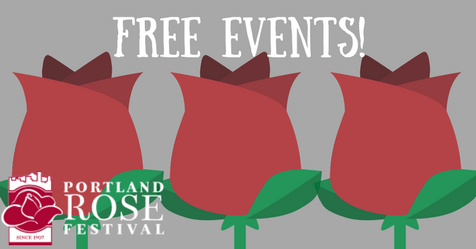 For a more detailed calendar of festival events, check the Portland Rose Festival calendar. Fireworks. FREE. This awesome display over the Willamette River marks the official opening night of the Rose Festival and the CityFair amusement park. Friday, May 25, nightfall, approx. 9:50 p.m.
CityFair. $5 admission for ages 7 and older when purchased in advance. For three consecutive weekends, a carnival atmosphere will take over Waterfront Park. Rides, games, live music and entertainment, shopping, food and beverages May 26-28, June 1 – 3, and June 8 – 10. Starlight Parade. FREE. This is the less serious, more casual prelude to the Grand Floral Parade. Before the marching bands and humorous floats go by, cheer for the runners in the Starlight Run, many of them in costume. The run follows the parade route and begins 45 minutes before the parade. Saturday, June 2, 8:30 p.m., downtown Portland. Junior Parade. FREE. It’s the nation’s oldest and largest children’s parade, for and featuring children, their pets and bands from elementary and middle schools. The parade runs through the Hollywood District in Northeast Portland. Wednesday, June 6, 1 p.m.
Fleet Week. FREE. The arrival of guest ships from the U.S. and Canadian navies is always a spectacular display, with Portland fireboats spraying red, white and blue water, and private boats escorting the ships to Portland’s seawall. Look for the sailors marching in the Grand Floral Parade. Ships will be docked in the river June 6 – 11. Ship tours, FREE. Spring Rose Show. FREE. This is the 130th annual Spring Rose Show and is the largest and longest-running rose show in the nation. But roses are what Portland’s all about, especially during Rose Festival. Held at Lloyd Center. Thursday, June 7, 1 – 9 p.m. Friday, June 8, 10 a.m. to 5 p.m.
Honorary Knighting Ceremony. FREE. Every year the Queen of Rosaria knights certain community leaders. This year the ceremony will take place at the Washington Park Amphitheater, 410 SW Kingston Ave. Friday, June 9, 9:30 a.m.
Grand Floral Parade. FREE for spectators along the parade route. Tickets for reserved seating at the Memorial Coliseum range from $15 to $30. Paradegoers inside the Coliseum will see the Coronation of the Queen of Rosaria. Saturday, June 9, 10 a.m.
Good in the Hood Multicultural Festival. FREE. This multicultural music and food festival with live music, a parade, market place, beer and wine garden and a kids’ spaces at King School Park on Friday, June 22, 6 – 10 p.m., Saturday, June 23, 12 – 10 p.m. and June 24, 12 – 8 p.m. The para is Saturday at 11 a.m.
Dragon Boat Races. FREE. Watch from the riverbank near the Hawthorne Bridge as teams compete in beautifully carved wooden boats from Portland’s sister city in Kaohsiung, Taiwan. Saturday, June 9 and Sunday, June 10, 8 a.m. to 5 p.m. Milk Boat Races. FREE. Watch kids and adults race and show off their handmade, human powered boats made of recycled milk cartons and jugs at the Westmoreland Casting Pond on Sunday, June 24, at 11 a.m.